Government cracks down on unsafe lorries | What Car? The Government is cracking down on lorries that put other road users at risk. An extra 24m is being given to the Vehicle Operator Services Agency (VOSA) to fund a 50% increase in the number of checks carried out, helping to ensure that these lorries are more effectively apprehended. Enforcement figures show that HGVs from abroad are more likely to be overloaded, unroadworthy or driven in excess of drivers' hours rules than their UK counterparts. 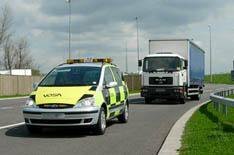 With the money, VOSA will also be able to open two more enforcement sites in locations where there is a high volume of high-risk HGV traffic. It will also allow inspectors to carry out checks 24 hours a day, every day of the week, at two sites, one on the M6 and one in North Wales. Similar '24/7' checks will happen at other sites over a three-year period. In addition, VOSA will be able to employ 97 more enforcement staff and almost double the number of prohibitions they issue, where a driver or vehicle is prevented from continuing their journey until the fault has been rectified. VOSA already uses technology to tackle unroadworthy foreign vehicles, including weigh-in-motion sensors to spot overweight vehicles and automatic numberplate recognition technology to spot operators with a poor compliance record. • Last year, the Department for Transport handed out 'Fresnel' lenses to foreign drivers, which cut the incidents of side-swiping (overtaking accidents caused by foreign drivers' poor visibility) by 59%.